Brenda Torpy, chief executive officer of Champlain Housing Trust, answers questions from reporters at Monday’s announcement. A group of housing advocates, elected officials, developers and other local leaders are banding together to get 3,500 homes built in Chittenden County over the next five years. The new coalition, led by the Champlain Housing Trust, Housing Vermont and the Chittenden County Regional Planning Commission, has about 100 members. 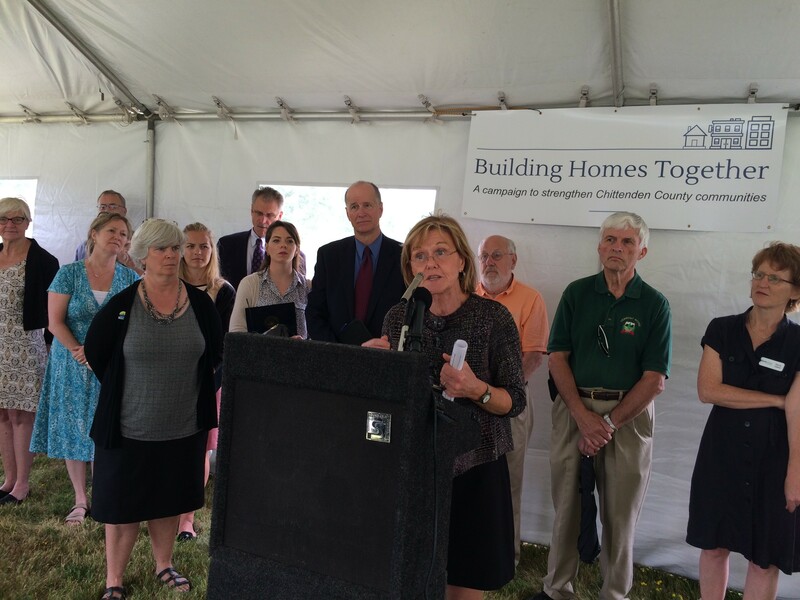 Monday morning, roughly 50 of them gathered outside a CHT housing development in South Burlington to announce the new initiative, dubbed Building Homes Together. Burlington Mayor Miro Weinberger and Colchester town manager Dawn Francis also announced at the media event their support for the partnership. In 2014, the county gained about 600 units of new housing, but the average in recent years has been closer to 450 units, according to Charlie Baker, executive director of the Chittenden County Regional Planning Commission. He noted that roughly 1,000 people move to the county each year, creating a tight housing market that’s unaffordable for too many people. The new initiative would add 700 units each year. The coalition also wants 20 percent of the 3,500 new units to be affordable housing developed by nonprofit organizations. While the group wasn’t ready to offer specific policy proposals Monday, there are a number of influential people — ranging from state senators to nonprofit directors — who will be able to advocate for those proposals once they’re agreed upon. And Sen. Bernie Sanders (I-Vt.), Sen. Patrick Leahy (D-Vt.) and Congressman Peter Welch (D-Vt.) all have voiced support for the ambitious project. “This is not about one or two big things that need to happen. This is about a thousand little decisions,” Baker explained. He did note that the coalition plans to advocate for housing projects during the local development review process. That’s the time those projects most often encounter resistance and get scaled back. “Part of the role here will be to balance the conversation at those DRB [development review board] meetings a little bit more,” Baker said. The coalition may pursue changes in local zoning regulations, and will push for more public funding for affordable housing and infrastructure upgrades. Francis noted that Colchester is currently limited in what it can build because it lacks a municipal sewage system. “This step-up in production will not just provide new homes and infrastructure for communities, it’ll be a boost to the economy and contribute to the tax base,” Nancy Owens, the president of Housing Vermont, said in a press release announcing the campaign.